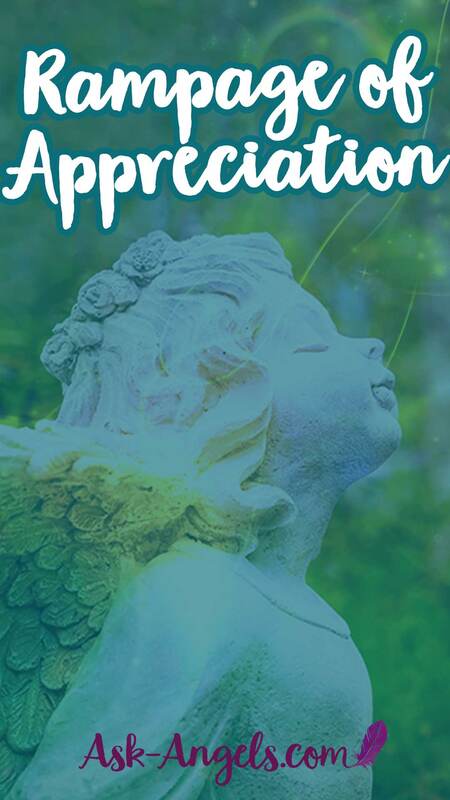 I'm excited to share with you a simple, yet powerful practice that’s called a rampage of appreciation. 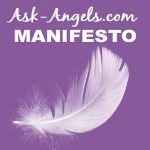 Esther Hicks who channeled Abraham first coined this term and concept years and years ago and it's something that you’re really able to hear once and run with which is part of why it's so powerful… because it's simple. The rampage of appreciation is essentially going on a rampage of expressing gratitude for anything and everything that you're thankful for. The definition of rampage, I looked it up because I wanted to be sure, literally means to rush around in an uncontrollable, reckless or even violent manner. Now, violence is something that I'm not a proponent of, but when you look at the ancient word meaning of violence, it comes from a Latin word for strength So, that, I can work with. 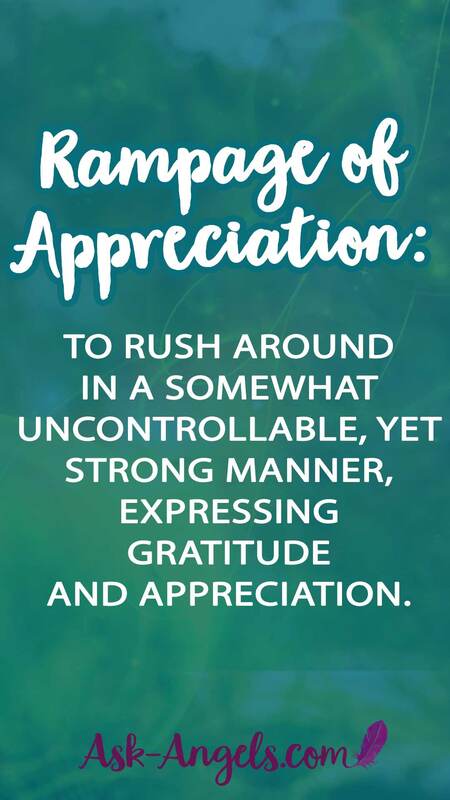 A Rampage of Appreciation means: To rush around in a somewhat uncontrollable, yet strong manner, expressing gratitude and appreciation. That being said, I like this practice because you can do it anywhere. You can do it at any time, internally or externally and it will create a powerful shift in your energy. When you lean in with gratitude towards what you're thankful for, towards the many blessings in your life, not only does it shift your point of resonance and rewire your energetic field, so that you are vibrating higher, vibrating in alignment with gratitude and with blessings, but it yes, does assist you in attracting more things to be grateful for in return. So, to do this practice, all you have to do is focus your attention, focus inward, and begin the exercise with awareness, by either internally or looking around in the external, finding something you have to be grateful for. Start with one thing, and express it either internally, speaking out loud, or writing it down on paper. Declare one thing you’re grateful for… And then keep going! For example, I'm grateful for the trees around my house. I'm grateful for my yard. I’m grateful for the town I live in. I’m grateful that I have this opportunity to be alive. I’m grateful that I, as a divine spiritual being incarnated into physical form, to share a message of positivity. I’m grateful that you are tuning into this message. I’m grateful that you are getting inspired to fill yourself up with gratitude, so that you are vibrationally sending out positivity, creating a ripple of love, light and positivity in the world to essentially shift the vibration of the collective consciousness of humanity and all that is. I’m grateful for this notebook I have, big notebooks to write down big inspired ideas. I’m grateful for my sparkly pens. I’m grateful that I know how to write. I’m grateful that I’m good at spelling. I’m grateful that other people like reading the things I write. I’m grateful that I have so many blessings in my life. Okay, so are you getting an idea of how this works? You literally start expressing gratitude and appreciation for anything and everything you have to be grateful for, and then keep going! Focus in on one thing, and then quickly move on to focus on the next… Fully filling your mind with gratitude. Doing this practice shifts your point of attraction and your energy. It raises your vibration and empowers you to send out positive energy into the world, and as a result, you attract more things for you to be grateful for, manifesting more blessings into your life. So, that's my take on the rampage of appreciation. I definitely recommend dive in and do this practice now! Tune in, focus, and one thought after another, take control of your mind to focus on what you're thankful for, and what you're grateful for because with awareness, and focus there really is so much! It just takes tuning into it and when you do, you shift your vibration. Okay, I hope this is helpful for you.